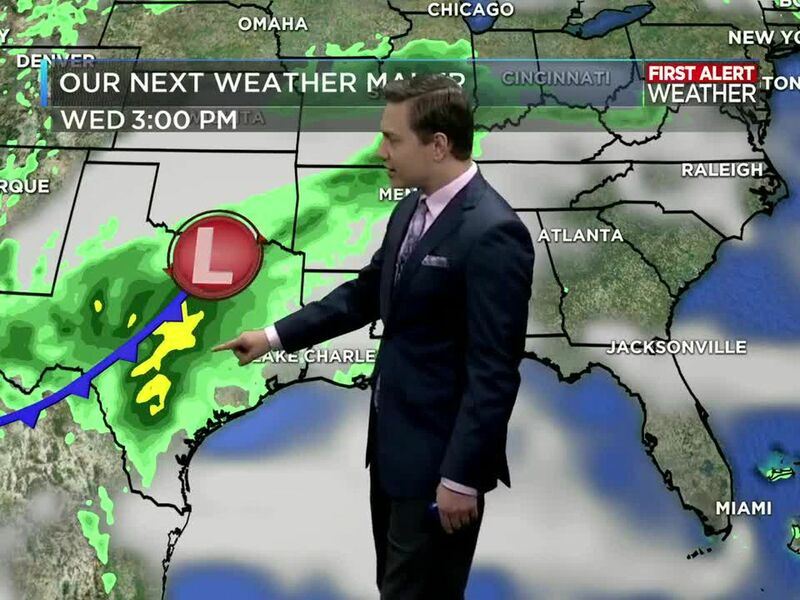 A weak cold front moved through Southwest Louisiana Monday afternoon bringing some scattered showers and thunderstorms. 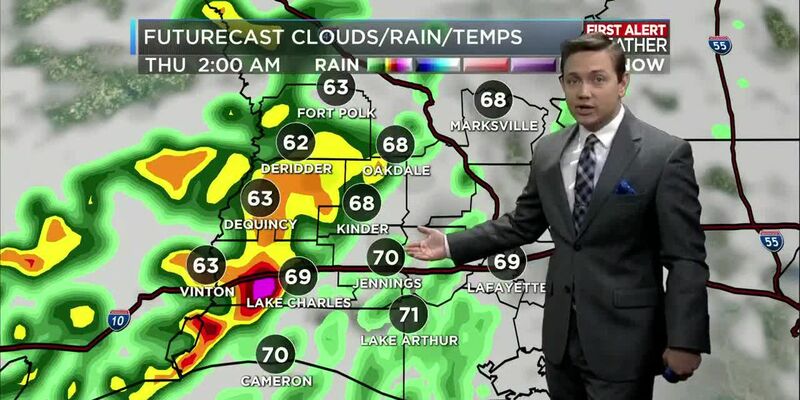 A weak cold front moved through Southwest Louisiana Monday afternoon bringing some scattered showers and thunderstorms. The front also brought slightly cooler and drier air back to the area and that means the next few days will be very nice! Tuesday will be beautiful with clear skies and no chance of rain. Temperatures will be a little cooler too with lows ranging from the upper 40s north of I-10 to the upper 50s at the coast. Afternoon highs will top out in the mid 70s, but with lower humidity it will feel comfortable. Wednesday morning will be cooler with lows ranging from the low 40s north of I-10 to the low 50s at the coast. 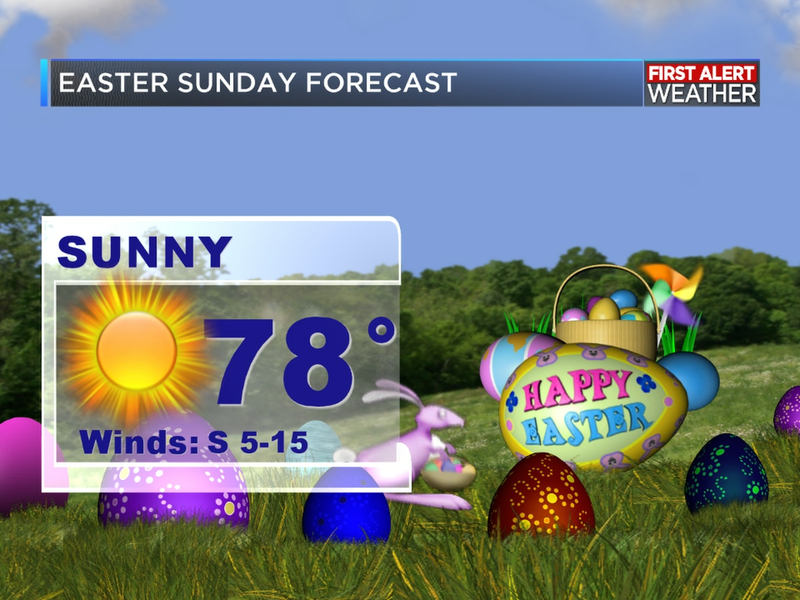 Abundant sunshine will warm temperatures quickly with highs topping out in the low 70s. The nice weather will continue into Thursday with temperatures only a few degrees warmer than Wednesday. So it will be another great day to be outside, with no rain expected. Changes begin Friday as southerly winds return and that means the humidity will be higher. Temperatures will be warmer too with lows in the 50s and 60s and afternoon highs in the mid to upper 70s. Clouds will be increasing too, and we may see a few showers, but the chance of rain is only 20% for now. Continue to monitor our forecast for updates as the timing of the rain may change. A cold front will slowly move into our area this weekend and that means rain will be in the forecast. The finer details of the forecast will likely change and that means the exact timing of the rain could change, so don’t cancel outdoor plans just yet! However, the forecast will call for a 40% chance of scattered showers and storms Saturday and a 30% for Sunday. 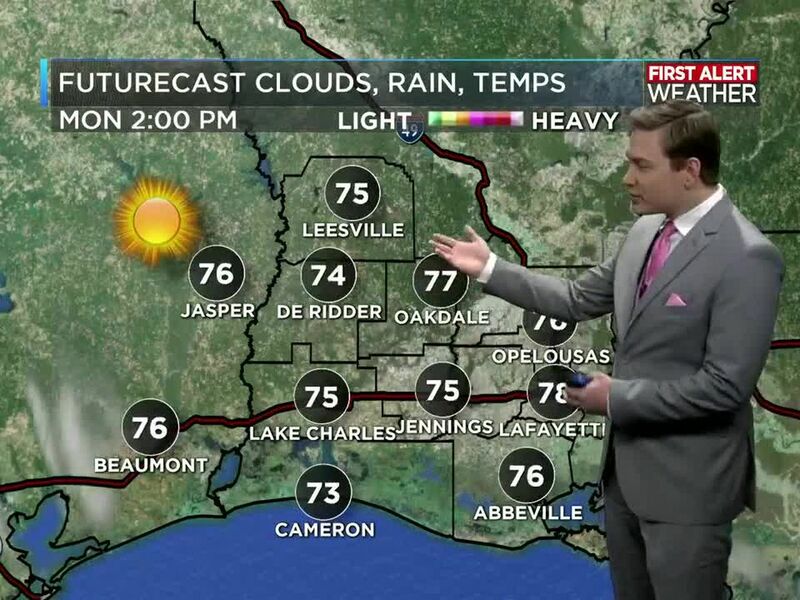 The weekend front will bring cooler and drier air back to Southwest Louisiana for next week. Lows will likely drop into the 40s and 50s in most areas for the first few days of next week with highs in the low 70s. Overall, similar to the weather for the next few days mentioned above. The confidence in the forecast for the weekend is rather low, and subject to change with time. So please continue to check our forecasts for updates daily, and don’t cancel any outdoor plans yet. Wade Hampton joined the KPLC 7Stormteam in August of 2005. He comes to KPLC from the cold of Wyoming, having been the Chief Meteorologist for the NBC affiliate KCWY in Casper. Wade is a native of Arcadia, Florida, which is inland south of Tampa, so he is familiar with the heat and humidity that SW Louisiana is known for. 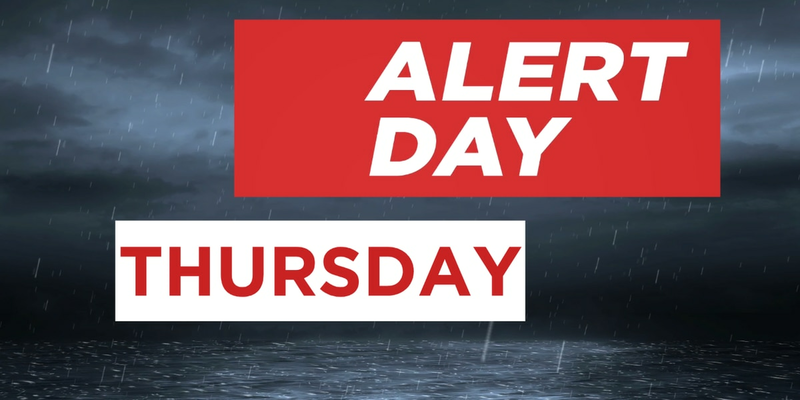 A First Alert Weather Day is in effect for Thursday and impacts will not be limited to the damaging winds and very heavy rain could lead to flash flooding and come at a bad time as the morning commute will be impacted. Wednesday will have slightly higher rain chances. There will be a 20% chance of rain for the day. This is from a system to our west that will bring a cold front through by Thursday. 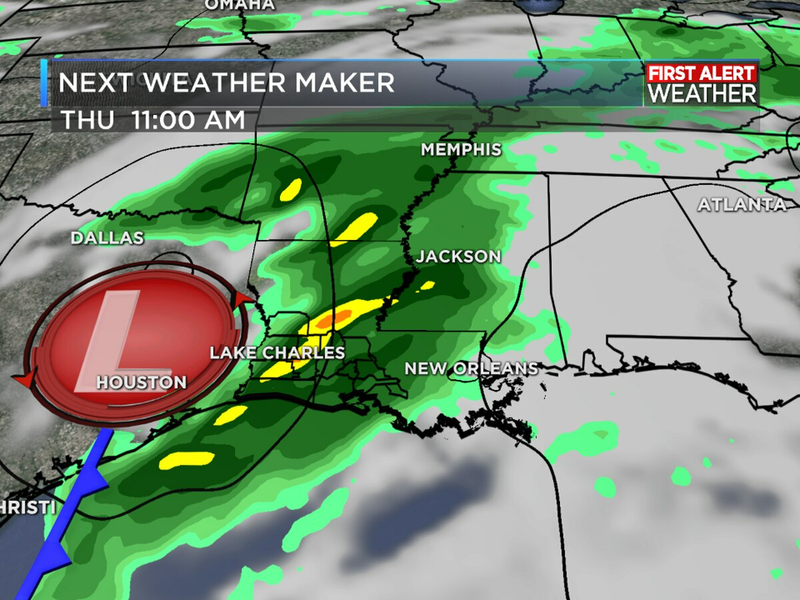 As the system gets closer on Wednesday, there could be a few showers that pop up ahead of the cold front.